Shootings are up in New York City for the second year in a row, and The New York Post thinks it’s because Mayor Bill de Blasio “ended” stop-and-frisk. “How many New Yorkers must die before the mayor brings back stop-and-frisk?” read the apoplectic headline of a column by the paper’s editorial board this week. “De Blasio famously ended the NYPD’s aggressive efforts to spot hidden guns and knives by stopping, questioning and sometimes frisking suspicious characters,” the board wrote. But de Blasio never “ended” stop-and-frisk, nor did he “ban” it. He only reined in the New York City Police Department's use of the tactic, which was ruled unconstitutional by a federal judge in 2013. In the decade before de Blasio came into office in 2014, police officers stopped, questioned and sometimes frisked over 4 million people on the streets of New York -- nearly 90 percent of whom were completely innocent of any crime, and nearly 90 percent of whom were black or Latino. And these stops had a negligible impact -- if any impact at all -- on the city’s crime rate. "If only stop-and-frisk was responsible for getting guns off the street,” Jennifer Carnig, director of communications at the New York Civil Liberties Union, said. “During the [Michael] Bloomberg administration, when the practice grew out-of-control, street stops targeted innocent people. During the entire 11-year period for which we have data available, the NYPD stopped innocent people upwards of 4 million times, and the gun-recovery rate was .016 percent." 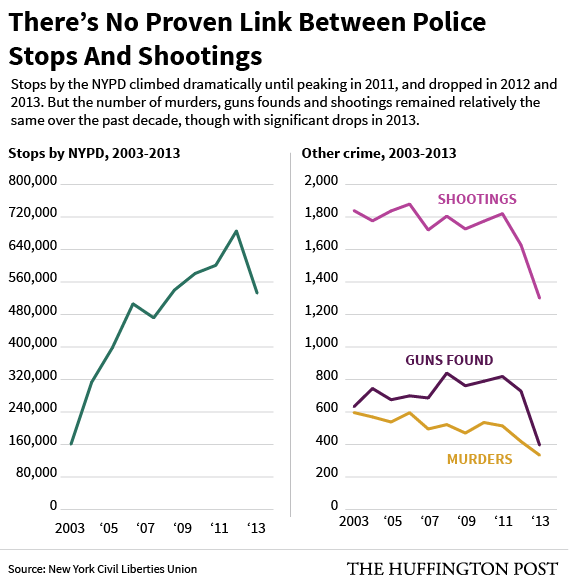 Similarly, as the number of police stops ballooned by 600 percent under Mayor Bloomberg -- peaking in 2011 at nearly 700,000 stops -- the number of shootings and murders stayed relatively flat. And from 2011 to 2013, when the number of police stops dropped a precipitous 75 percent, the number of shootings and murders also dropped, by 29 percent. The city’s murder rate, meanwhile, fell to a historic low in 2013. “It's sad that people don't want to take time to think through this stuff,” city council member Jumaane Williams said. Williams was on the forefront of the campaign to reform the NYPD’s use of stop-and-frisk. “You can't stop everyone in the neighborhood, and that's what the problem was,” Williams added. The question remains: How to quell gunplay in an era when stop-and-frisk tactics — for years among the Police Department’s principal tools for curbing street violence — are employed far less frequently than before its excessive use came under widespread criticism. “The Times piece takes for granted that the only ideas to combat violence emanate from [NYPD headquarters at] One Police Plaza,” Josmar Trujillo, of the police reform group New Yorkers Against Bratton, wrote in an email to The Huffington Post. Mark Winston Griffith, executive director of the Brooklyn Movement Center, also said the idea that a police department can be solely responsible for bringing down crime should be reconsidered. The Brooklyn Movement Center is a community group in the neighborhoods of Bedford-Stuyvesant and Crown Heights, which often see some of the city's worst violence. Council member Williams said he was interested in what other city agencies could do to help fight crime. The Department of Youth and Community Development could mediate gang disagreements, he suggested, and the Department of Education could make sure there are adequate after-school programs to keep kids off the streets. He said it’s important for young people to have opportunities for employment in summer months, when crime typically spikes. Ed O’Neill, the NYPD’s chief of department, announced this week that there have been 439 shootings in in the city so far this year, compared to 403 during the same period last year. Similarly, the number of shooting victims so far this year rose to 520 people, compared to 467 in the first five months of 2014. “We’re struggling with homicides and shootings,” O’Neill told reporters. Plus, overall crime in New York has dropped 6 percent this year. In 2014, de Blasio’s first year in office, the number of police stops dropped dramatically, to 46,235, and yet the murder rate also fell to another historic low. The mayor told reporters Tuesday that this reduction in police stops will ultimately help officers reduce gun violence. "We’ve taken time away from the needless stops," de Blasio said, according to DNAinfo. "We’ve taken time away from the low-level marijuana arrests. We’ve put that time into going after serious crime. You’re giving them better technology, better training. That will clearly turn the tide." The NYPD will also start its “Summer All Out” program this month, in which officers will be redeployed to high-crime areas. For Patrick Lynch, president of the Patrolmen’s Benevolent Association, the city’s largest police union, the NYPD simply needs more cops. "There are not enough police officers on patrol so management has to steal from one area of policing to shore up another,” he said in a statement to HuffPost. “There are also multiple levels of intense oversight and constant second guessing of officers enforcing the law that is counterproductive. We need thousands of more police officers and they need to have the backing and support of management and the city to do the difficult and dangerous job of getting guns off the streets and reducing crime." Both NYPD Commissioner William Bratton and the New York City Council have been pushing to de Blasio to hire 1,000 additional police officers, but the mayor has repeatedly pushed back against the idea. More cops are unnecessary, de Blasio told ABC News over the weekend, because police now have more tools at their disposal, including tablets, smartphones and the gunshot-detection system ShotSpotter.